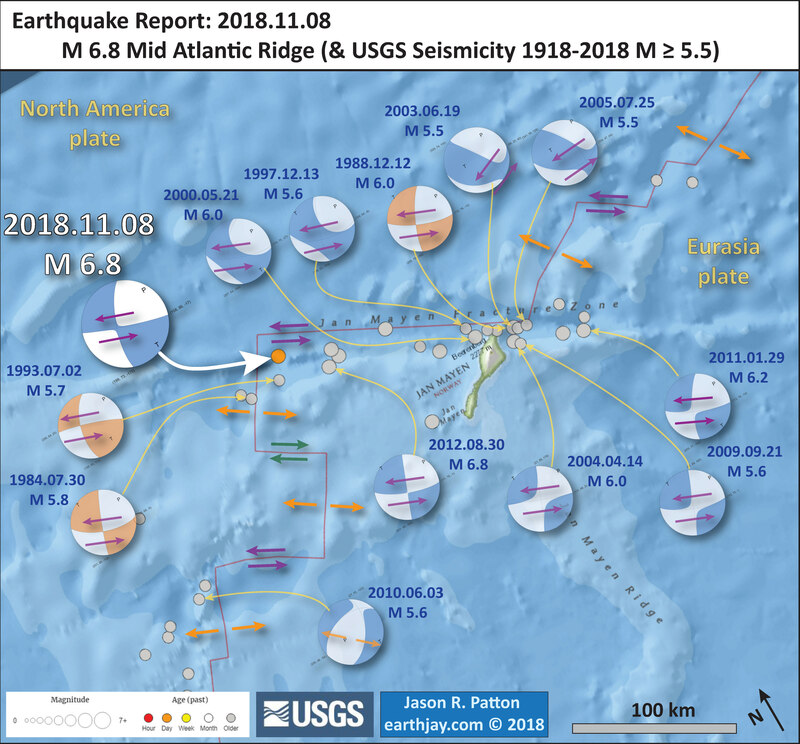 There was a M = 6.8 earthquake along a transform fault connecting segments of the Mid Atlantic Ridge recently. The Mid Atlantic Ridge is an extensional plate boundary called an oceanic spreading ridge. 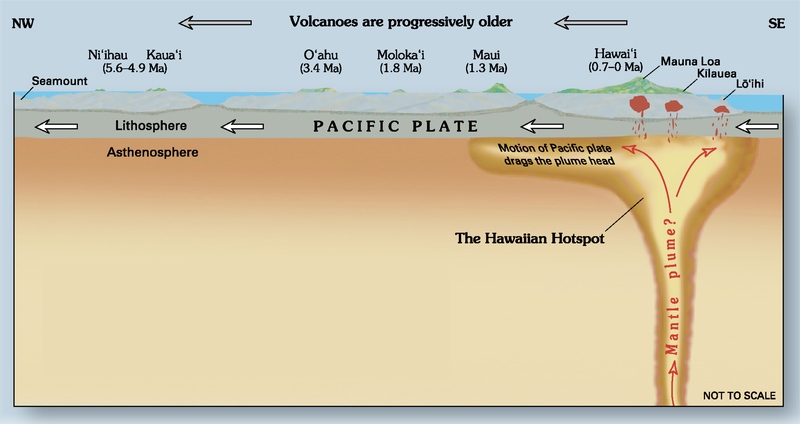 Oceanic crust is formed along these types of plate boundaries. Transform faults are faults that move side-by-side (i.e. strike-slip faults) that offset spreading ridges. Learn more about different types of faults in the geologic fundamentals section below. The Atlantic Ocean is known for the spreading center, Mid Atlantic Ridge (MAR), which was probably born in the mid Cretaceous Period, about 130 million years ago. We use the age of the oceanic crust at the eastern and western margins of the Atlantic Ocean as a basis for this interpretation. The Mid Atlantic Ridge also splits apart the island of Iceland, which also overlies a volcanic hot spot. I have always wanted to visit Iceland to see the rocks get older as I might travel east or west from the middle of Iceland. North of Iceland, the MAR is offset by many small and several large transform faults. 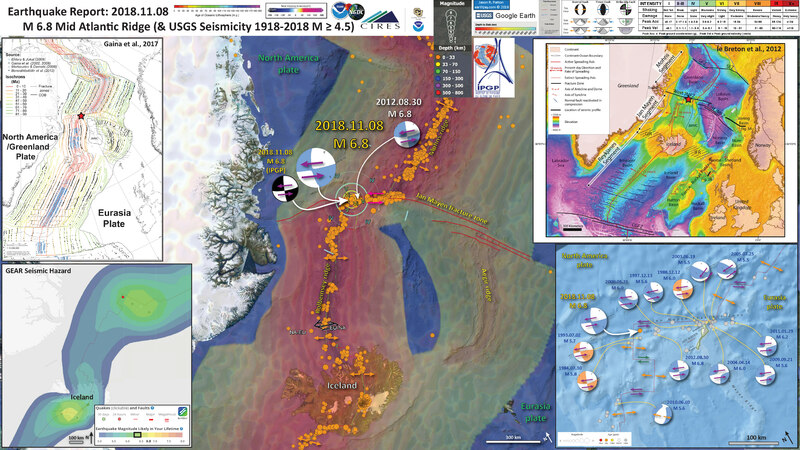 The largest transform fault north of Iceland is called the Jan Mayen fracture zone, which is the location for the 2018.11.08 M = 6.8 earthquake. I plot the seismicity from the past month, with color representing depth and diameter representing magnitude (see legend). I include earthquake epicenters from 1918-2018 with magnitudes M ≥ 4.5 in one version. I plot the USGS fault plane solutions (moment tensors in blue and focal mechanisms in orange), possibly in addition to some relevant historic earthquakes. 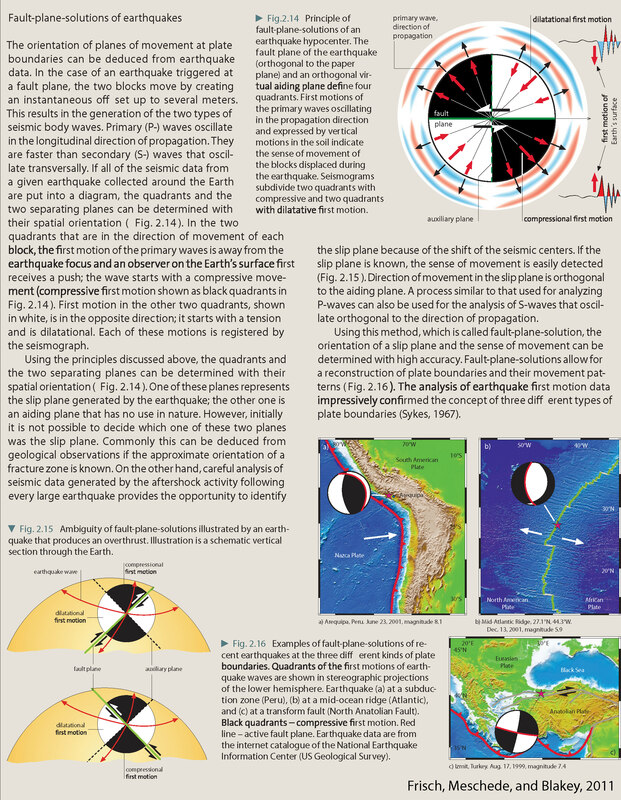 I also include the IPGP focal mechanism as that was available before the USGS moment tensor was available (I included it in my initial poster). In the map below, I include a transparent overlay of the magnetic anomaly data from EMAG2 (Meyer et al., 2017). As oceanic crust is formed, it inherits the magnetic field at the time. At different points through time, the magnetic polarity (north vs. south) flips, the north pole becomes the south pole. These changes in polarity can be seen when measuring the magnetic field above oceanic plates. This is one of the fundamental evidences for plate spreading at oceanic spreading ridges (like the Mid Atlantic Ridge). We can see the roughly north-south trends of these red and blue stripes. These lines are parallel to the ocean spreading ridges from where they were formed. In the map below, I include a transparent overlay of the age of the oceanic crust data from Agegrid V 3 (Müller et al., 2008). Because oceanic crust is formed at oceanic spreading ridges, the age of oceanic crust is youngest at these spreading ridges. The youngest crust is red and older crust is yellow (see legend at the top of this poster). In the upper right corner is a plate tectonic map from Le Breton (et al., 2012). This map shows the configuration of the Mid Atlantic Ridge (MAR) and shows their interpretation about how this spreading center is divided into segments separated by transform faults. I placed a red star in the general location of the M = 6.8 earthquake. In the upper left corner is a map showing the isochrons (lines of each age for the crust) as summarized by Gaina et al. (2017). Isochrons are displayed with color relative to age. In the lower right corner is a larger scale map zoomed into the Jan Mayen fracture zone at the MAR. I placed existing USGS fault mechanisms (blue = moment tensor, orange = focal mechanism) for earthquakes with magnitudes M ≥ 5.5. In the lower left corner is a map from the Temblor.net app. This map shows the seismic hazard from the GEAR model (Bird et al., 2012). Seismicity is shown as colored circles. The red dot is the M = 6.8 epicenter, which lies in a region that is forecast to have an earthquake of magnitude M = 6.25-6.5 in someone’s lifetime. Here is the large scale map showing earthquake mechanisms for historic earthquakes in the region. Note how they mostly behave well (are almost perfectly aligned with the Jan Mayen fracture zone). There are a few exceptions, including an extensional earthquake possibly associated with extension on the MAR (2010.06.03 M = 5.6). Also, 2 earthquakes (2003.06.19 and 2005.07.25) are show oblique slip (not pure strike-slip as they have an amount of compressional motion) near the intersection of the fracture zone and the MAR. 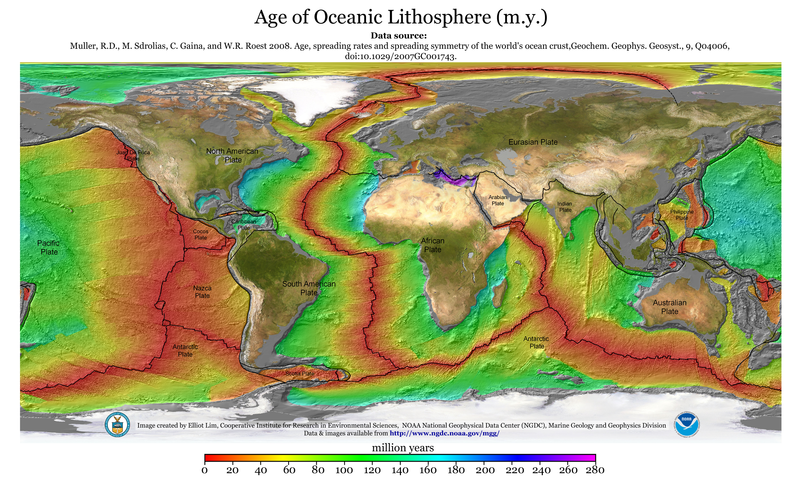 Here is a map that shows the ace of the oceanic lithosphere for the entire Earth. Here is the tectonic map from Le Breton et al. (2012). Depth to the seafloor is shown in color. Note the spreading rates in red. Note how the MAR is offset by the Jan Mayen fracture zone, as well as the smaller unnamed fracture zones. projection is Universal Transverse Mercator (UTM, WGS 1984, zone 27N). This is a fantastic figure that shows the isochrons on either side of the MAR in this region (Le Breton et al., 2012). Isochrons are lines of equal age, based on magnetic anomaly mapping and numerical ages from rock samples collected from the oceanic crust.The geomagnetic time scale is shown at the right. “Chrons” are numbered with their numerical ages in millions of years (Ma). These chron numbers are also on the map, showing the chron number for each isochron. For some reason I want to watch the film Tron right now. Map of magnetic anomalies, NE Atlantic Ocean. Background image is recent model EMAG2 of crustal magnetic anomalies [Maus et al., 2009]. Ages of magnetic anomalies are from Cande and Kent . Map projection is Universal Transverse Mercator (UTM, WGS 1984, zone 27N). This map shows their reconstruction of the fracture zones, MAR, and the Iceland Hot Spot for the Tertiary to present (Le Breton et al., 2012). Here is the Gaina et al. (2017 a) isochron map for this region of the north Atlantic Ocean. Below are also some great summary figures that show a series of geophysical data from their work in the region (Gaina et al., 2017 b). Magnetic anomaly and fracture zone identifications and interpreted isochrons. On the left is a free air gravity map (Gaina et al., 2017 b). This is a gravity map after the “free-air” correction has been made (that corrects for the elevation that the gravity data were observed). On the right is the isostatic gravity anomaly map. This is a gravity map that shows the results of correcting the gravity data for the variable density of materials in the earth’s crust and mantle. On the right is the sediment thickness map. This is a really cool map that shows how the MAR extends further into the Arctic Ocean. Color represents depth to the seafloor (Mjelde et al., 2008). Le Breton, E., P. R. Cobbold, O. Dauteuil, and G. Lewis (2012), Variations in amount and direction of seafloor spreading along the northeast Atlantic Ocean and resulting deformation of the continental margin of northwest Europe, Tectonics, 31, TC5006, doi:10.1029/2011TC003087.